A useful safety feature or a step too far? Imagine you just pulled up to the Cheesecake Factory. If you have ever eaten there before, you know they serve some tasty cuisine. With my family, the first one out the door usually gets to pore over the menu before anyone else and make their picks. It’s a race to the culinary finish line, and after parking I’m usually the last one to arrive at the table. Of course, having kids bolt out of your crossover isn't ideal. There are cars everywhere, and some of them are being driven by teenagers with a freshly minted driver’s license. Sure, cars are moving at low speeds, but you have to stay super vigilant. 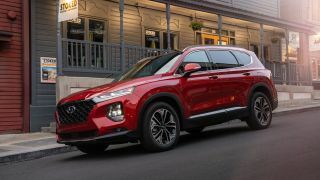 In a recent test of the 2019 Hyundai Santa Fe, which was redesigned for this model year, I was not as worried. A new feature called Safe Exit Assist became a great ally. Here’s how it works. For starters, if you're parked and a car approaches from behind, a new tech in the Santa Fe kicks in. It’s called Rear Cross-Traffic Collision-Avoidance Assist (RCCA) and alerts you to other vehicles from the rear. You see a yellow exclamation mark in the display, and if you are backing up, the Santa Fe will brake automatically. That’s nice, but I was more interested in Safe Exit Assist. I asked my wife to sit in the back of the crossover and locked the doors. Then, I turned off the Electronic Child Safety Lock with the press of a button. This means anyone can exit on their own. We waited until a car approached from the rear and side, and she tried to exit. The Santa Fe showed an alert in the display and beeped, and also enabled the safety locks so she wasn't able to leave. We waited a bit longer, and when no cars were approaching she was then able to go. A Hyundai rep said the tech is even more advanced – if she had opened the door but then a car had approached, the Santa Fe would have also beeped (we chose not to test that). It’s a fantastic new feature, even if it is slightly dystopian. As usual, I started thinking about cars taking over for us. Maybe they won’t unlock if they 'smell' too much beer on our breath, or at least only drive autonomously. In some ways, the Safe Exit Assist reminds me of how, on some GM cars, you can’t disable the automatic engine off feature anymore. The engine will always shut off when you stop. On the positive side, maybe autonomous cars will watch how we drive and adjust settings in real-time to match our driving prowess. We won’t even notice. I like how the Santa Fe keeps passengers safe – and really, that is where we want technology to make the most intrusive decisions, monitoring the situation and preventing us from making dumb mistakes since we can’t pay attention to every problem at all times. That said, I would prefer a few more options for the setting. Maybe there is a master override, and a way to tweak the settings for whether the alerts are visual or audio only. At the shopping mall, the beeps and alerts appeared quite frequently. I’ll take the features the way they are if they keep everyone safe. It’s a trade-off between necessary precautions and feeling like tech is making decisions for us.